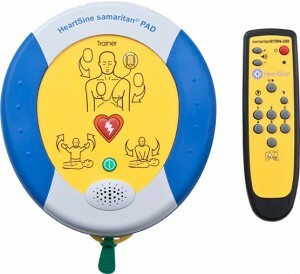 The easy-to-use HeartSine samaritan PAD Trainer with remote control guides users through simulated analysis, energy delivery and prompted Cardiopulmonary Resuscitation (CPR) with the look and feel of a live HeartSine samaritan PAD without the actual charge and discharge of an electrical shock. The HeartSine samaritan PAD Trainer is available in both SAM 350P/360P and SAM 500P models. The SAM 500P Trainer simulates the SAM 500P AED by providing the same visual and verbal CPR Advisor prompts that guide the rescuer to a good depth and rate of compressions. Note: HeartSine strongly advises that potential users of defibrillators ensure their training is in line with current ERC/JRC/AHA Guidelines and are aware of the regulations and guidelines relating to training and the use of an AED in their specific country. To purchase HeartSine products and accessories, please contact your local Physio-Control/HeartSine representative.